Establish a stable, level piece of ground. Set a row of 240mm (diam.) plant pots @ roughly 260mm centres aligned upon a polythene sheet. Set a second row of pots (as first row) in parallel @ roughly 860mm centres. Fill pots with soil and compost and firmly bed-in. pots set upon the polythene sheeting. Introduce 4No. cut 1250mm canes (as before) into the other row of pots. Check uprights are vertical. open ended side. Alternately weave each member in-and-out of uprights. Once located firmly secure with string at all junctions. For further stability to the frame introduce 3No. cross-brace members to all 3 sides and tie firmly to frame. Introduce 4No. pre-cut garden cane roof members to produce a fall. All junctions with the frame are to be firmly tied with string. structure. To improve wind-bracing tuck the end of the polythene sheet beneath the bases of the second row of pots. Pierce a sequence of 10mm (diam.) holes through the sheet and adjacent to upright and roof members. Tie the sheet through these holes back to the sub-frame. door. To allow for ventilation, pierce a sequence of 10mm holes through all facades at high and low level. 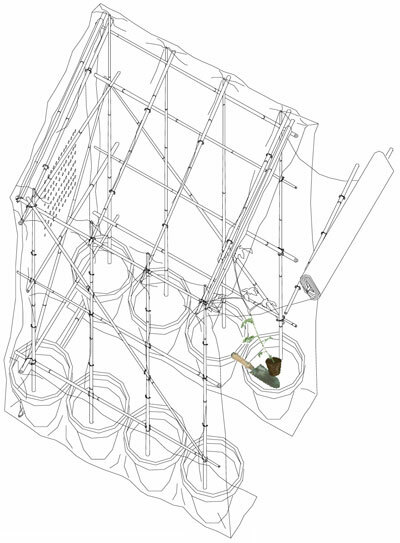 For a tomato-house prototype finally plant out tomato plants within each pot, ‘firm in’, and water well.